GLCS Galvanised Steel Folding IBC (500 Ltr). Heavy duty Galvanised steel construction, manufactured from heavy gauge steel for the most demanding environments. Forklift truck and pallet truck. Optional fork-loop arrangements available. The dimensions of H920mm x L1200mm x W800mm (Euro Pallet Base) and a 7 degree slope make this unit ideally suited to product that flows easily. The GLCS Galvanised Steel foldable bag-in-box is a low cost rental option for the transport and storage of liquid products such as SCM, fruit juice, dairy products and cosmetics. The GLCS has a capacity of over 500 litres, is built to last and has unrivalled strength. Easy to assemble, fill and discharge. Large outlets aid product discharge. 2” and 3" cutter membrane and 2” and 3" butterfly valve liners. Available in 3 ply LLDPE, can be manufactured with intermediate barrier layers if required. All Liners are manufactured by Metano to the highest standards in our BRC approved ISO validated clean room. All Metano rental units are reusable and can be recycled at the end of life. Metano can offer a truly sustainable cradle to grave rental solution for all your liquid packaging needs. 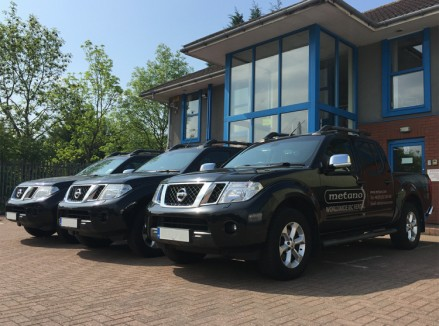 Contact Metano Today for a rental Quote.